We’ve been playing with toy construction vehicles and building as part of our focus on Construction Imaginative Play this week on SEN Resources Blog. But why should Imaginative Play and Fun be limited to play time? We don’t think is should and that’s one of the reasons we’ve fallen in love with the Construction Saver Pack (Winslow Resources). Not only does it ensure fun and creativity is brought to the dinner table but it is also incredibly practical in helping children who are learning to use utensils. Especially if the fine motor control of holding and using regular utensils is posing a challenge. Fun– Meal times should be enjoyable and this plate and utensil set has certainly made ours more fun. We’ve loved referring to the utensils by their names ‘Front loader Spoon’ and ‘Forklift Fork’..it’s had my children in fits of giggles. What I particularly love is that although it’s great fun, it’s not fun in a distracting way. In fact, it’s quite the opposite, I’ve noticed an increase in attention and concentration of my child when using them. Separates Food– This is a big plus for two reasons. Firstly many children, including some autistic children for example, can struggle with different textured/coloured foods being next to one another or mixed in a plate. The plate allows you to separate foods out and avoid this issue. Secondly from a parental point of view, I found the meals I was creating ended up being more balanced than normal as the separated areas prompted me to think which vegetables I was including, if I’d got enough protein on the plate etc. 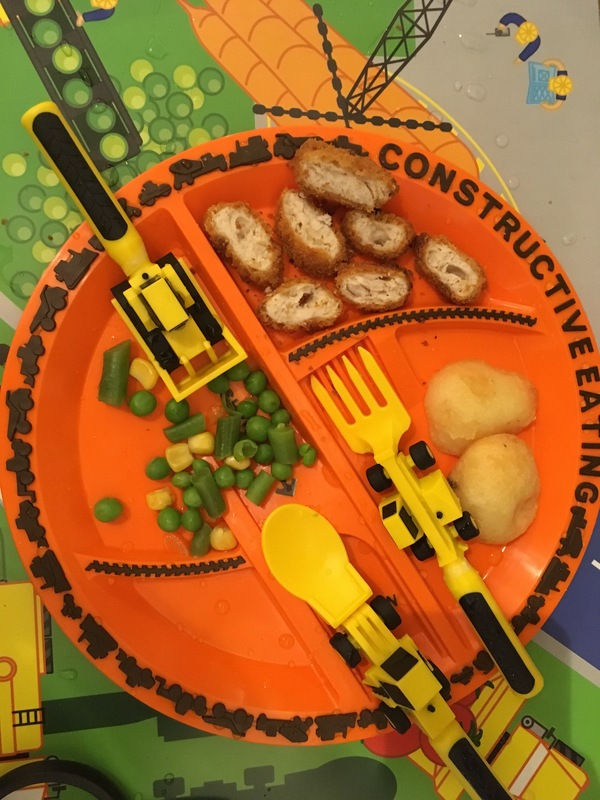 Makes Using Utensils Easier- The Bulldozer Pusher helps children push food onto the (Front Loader) spoon or (forklift) fork, making those tricky small vegetables much easier to eat. I have never seen my child manage to eat all his peas before! Placemat– The design of the placemat keeps children entertained whilst waiting for their meal. We found it could also help develop social skills as it’s a great conversation starter to discuss with the family around the table. Practical– From a practical viewpoint, I liked that the creators also state that the utensils and plate are dishwasher safe and that the plate is safe in the microwave. See what else we’ve been doing for our Construction Imaginative Play week here. Oh I like the look of this! My son is mad about diggers but struggling to master the art of eating with a fork or spoon. This could be the answer! Oh I hope so! We really enjoyed the set; lots of fun. Have a look at their website. Thanks so much for your comment.